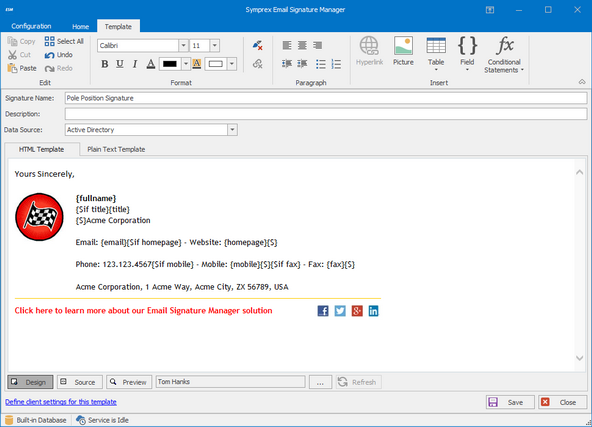 Email Signature Manager supports iPhone, iPad, Android, Blackberry and Windows Mobile devices right out of the box. Office 365 is also supported including Office 365 Outlook Web App, and the latest Outlook 2013 and Exchange 2013 are also supported. Email Signature Manager makes it easy to include a company logo as well as other relevant images and graphics. The automatic integration with Active Directory (or any user configures database) helps ensure that signatures always contain correct contact information. Discover why thousands of organizations worldwide have chosen Email Signature Manager as the solution to their email signature and disclaimer requirements. Download the free evaluation version and experience it for yourself.